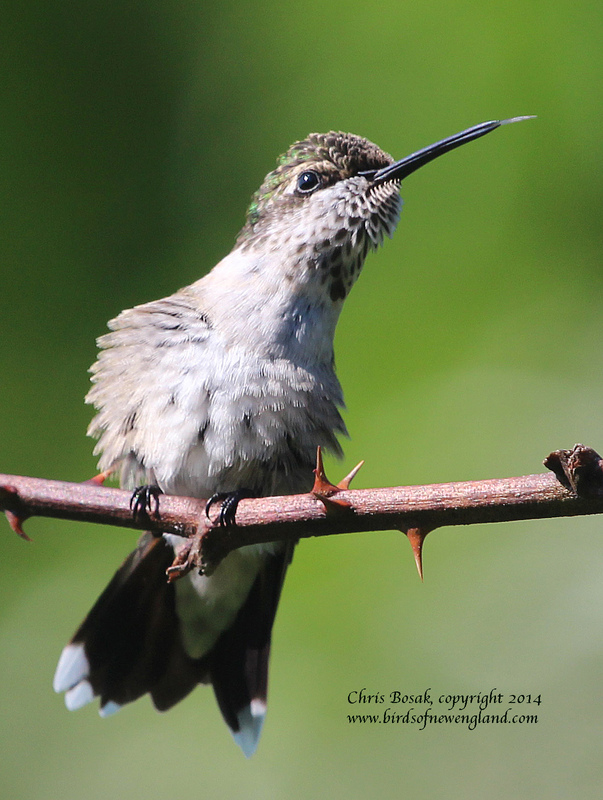 A female Ruby-throated Hummingbird perches on a thorny branch in Norwalk, Conn., summer 2014. Here’s the fifth photo in the hummingbird series. Here’s another one I got when I was watching the Ruby-throated Hummingbirds at the thorn bushes at the Dolce Center in Norwalk, Conn. I like the tongue sticking out. Your humming bird photos have been a total joy to see. Thanks. Had a viewing of a very large hawk, probably 20 ” tall, standing with wings spread to protect his kill, a chicken which was too heavy for the hawk to raise if off the ground. And I didn’t have a camera. I think it was a red-tailed hawk. Magnificent bird. Thanks Bitsy. How exciting about the hawk! Very cool. Hope things are well on the coast.